Earlier this week I released a comic entitled “Death of Copy Machine,” based on a true events that took place in my school (as most my comics are). Here’s a link to it if you missed it. Death of a copy machine comic. 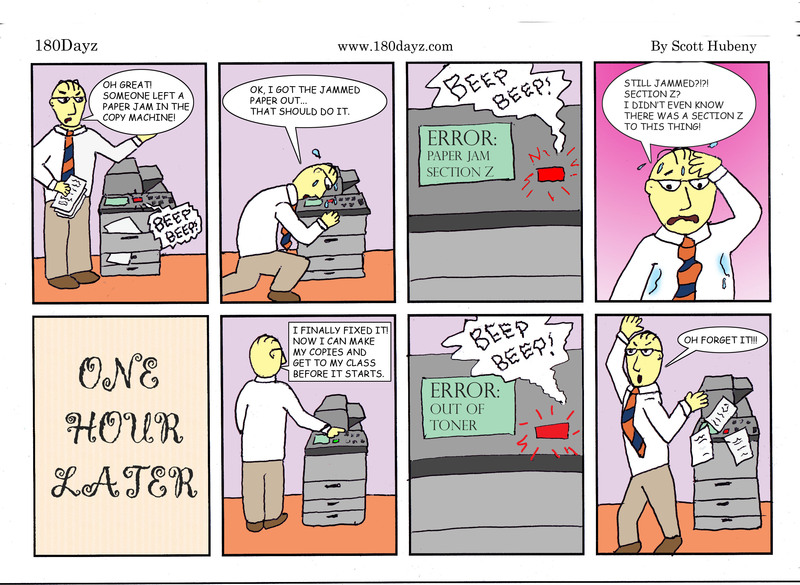 For this Throwback Thursday I reposted below a comic that shows why some photocopiers deserve a premature death! Enjoy, and if you want to see a video based on the comic here’s a link to it on the 180Dayz youtube channel Photocopier frustration video. Thanks and if you like please share 180Dayz with all those that could use a laugh (probably every teacher in the world right now, lol). Have you ever run into the copy room just to have this happen?